Colonel (/ˈkɜːrnəl/ "kernel"; abbreviated Col., Col or COL) is a senior military officer rank below the brigadier and general officer ranks. However, in some small military forces, such as those of Monaco or the Vatican, colonel is the highest rank. It is also used in some police forces and paramilitary organizations. The word "colonel" derives from the same root as the word "column" (Italian: colonna) and means "of a column", and, by implication, "commander of a column". 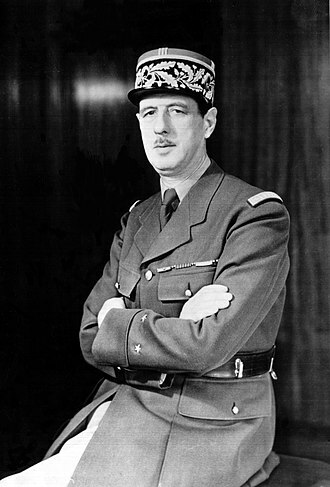 The word "colonel" is therefore linked to the word "column" in a similar way that "brigadier" is linked to "brigade", although in English this relationship is not immediately obvious. By the end of the late medieval period, a group of "companies" was referred to as a "column" of an army. Since the word is believed to derive from sixteenth-century Italian, it was presumably first used by Italian city states in that century. The first use of colonel as a rank in a national army was in the French "National Legions" (Légions nationales) created by King Francis I by his decree of 1534. Building on the military reforms of Louis XII's decree of 1509, he modernized the organization of the French royal army. Each colonel commanded a legion with a theoretical strength of six thousand men. The Spanish equivalent rank of coronel was used by the Spanish tercios in the 16th and 17th centuries. Gonzalo Fernández de Córdoba, nicknamed 'the Great Captain', divided his armies in 'coronelías' or colonelcies, each led by a coronel (colonel). However, the Spanish word probably derives from a different origin, in that it appears to designate an officer of the crown (corona, thus the rank coronel), rather than an officer of the column (columna, which would give the word columnal). This makes the Spanish word coronel probably cognate with the English word "coroner". As the office of colonel became an established practice, the colonel became the senior captain in a group of companies that were all sworn to observe his personal authority — to be ruled or regimented by him. This regiment, or governance, was to some extent embodied in a contract and set of written rules, also referred to as the colonel's regiment or standing regulation(s). By extension, the group of companies subject to a colonel's regiment (in the foregoing sense) came to be referred to as his regiment (in the modern sense) as well. In many modern armies, the 'regiment' has more importance as a ceremonial unit or a focus of members' loyalty than as an actual battle formation. Troops tend to be deployed in 'battalions' (commanded by a lieutenant colonel) as a more convenient size of military unit and, as such, colonels have tended to have a higher profile in specialist and command roles than as actual commanders of regiments. However, in Commonwealth armies, the position of the colonel as the figurehead of a regiment is maintained in the honorary role of "colonel-in-chief", usually held by a member of the royal family, the nobility, or a retired senior military officer. The colonel-in-chief wears a colonel's uniform and encourages the members of the regiment, but takes no active part in the actual command structure or in any operational duties. The title Colonel of the Regiment (to distinguish it from the military rank of colonel) continues to be used in the modern British Army. The ceremonial position is often conferred on retired general officers, brigadiers or colonels who have a close link to a particular regiment. 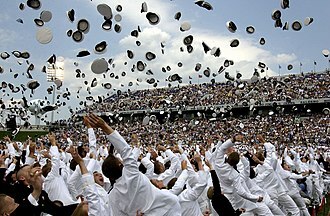 Non-military personnel, usually for positions within the Army Reserve may also be appointed to the ceremonial position. 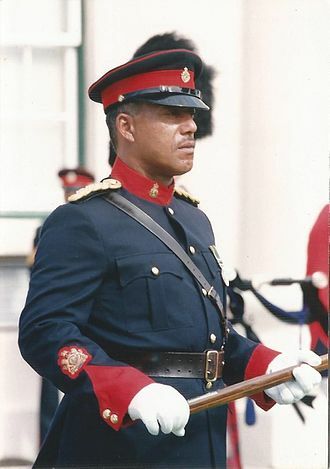 When attending functions as "Colonel of the Regiment", the titleholder wears the regimental uniform with rank insignia of (full) colonel, regardless of their official rank. A member of the Royal Family is known as a Royal Colonel. A Colonel of the Regiment is expected to work closely with a regiment and its Regimental Association. The Arabic word for "colonel" is عميد (ʿamīd) which comes from the same triconsonantal root as عمود (ʿamūd) meaning "column". Both words come from the root ʿ-m-d, column in the sense of "pillar" (عَمَد). This relationship is comparable to that "colonel" and "column" are cognates with Latin columna as common ancestor. In terms of equivalence, the Arabic colonel, ʿamīd, is conventionally considered to be equivalent to the Commonwealth rank of brigadier. 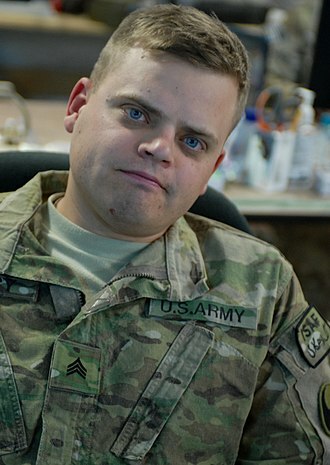 In addition, a non-Arab colonel is often referred to as "kūlūnīl" (كولونيل). In the Ottoman Empire, the Ottoman ranks miralay and qaimaqam were formerly used instead of the current Arab ranks ʿamīd and ʿaqīd. The Ottomans used a rank of "column chief", which was "kol ağa", from kol (column in Turkish) and ağa (chief in Turkish). However, in authority, this was more equivalent to a European major. The Ottoman army rank of "lieutenant governor" (kaymakam) was equivalent in authority to a European colonel. Kol ağa is no longer used. The word for a regiment, alay, can also mean a procession, or be loosely translated as a column of men. Alay was in the Ottoman army rank miralay ("regimental emir") and the Ottoman gendarmerie rank alaybeyi ("regimental bey"). These Ottoman ranks were equivalent to European brigade commanders. Kentucky colonel is the highest title of honor bestowed by the Commonwealth of Kentucky. Commissions for Kentucky colonels are given by the Governor and the Secretary of State to individuals in recognition of noteworthy accomplishments and outstanding service to a community, state or the nation. The sitting governor of the Commonwealth of Kentucky bestows the honor of a colonel's Commission, by issuance of letters patent. Perhaps the best known Kentucky colonel is Harland Sanders of Kentucky Fried Chicken fame. ^ Leab, Daniel J.; Leab, Katharine Kyes (29 December 1981). "The auction companion". Harper & Row – via Google Books. Rear admiral is a naval commissioned officer rank above that of a commodore and captain, and below that of a vice admiral. It is generally regarded as the lowest of the admiral ranks, in many navies it is referred to as a two-star rank. It originated from the days of naval sailing squadrons and can trace its origins to the Royal Navy, each naval squadron would be assigned an admiral as its head, who would command from the centre vessel and direct the activities of the squadron. The admiral would in turn be assisted by a vice admiral and this has survived into the modern age, with the rank of rear admiral the most-junior of the admiralty ranks of many navies. In some European navies, and in the Canadian Forces French rank translations, in the German Navy the rank is known as Konteradmiral, superior to the flotilla admiral. In the Royal Netherlands Navy, this rank is known as schout-bij-nacht, denoting the role junior to the squadron admiral, the Royal Australian Navy maintains a rank of rear admiral, refer to Australian Defence Force ranks and insignia. Since the mid-1990s, the insignia of a Royal Australian Navy rear admiral is the Crown of St. Edward above a crossed sword and baton, like the Royal Navy version, the sword is a traditional naval cutlass. The stars have eight points, unlike the four pointed Order of the Bath stars used by the army, prior to 1995, the RAN shoulder board was identical to the Royal Navy shoulder board. The Royal Navy shoulder board changed again in 2001 and the Australian, rear Admiral Robyn Walker AM, RAN became the first female admiral in the Royal Australian Navy when she was appointed Surgeon-General of the Australian Defence Force on 16 December 2011. In the Royal Canadian Navy, the rank of rear-admiral is the Navy rank equivalent to major-general of the Army, a rear-admiral is a flag officer, the naval equivalent of a general officer. A rear-admiral is senior to a commodore and brigadier-general, and junior to a vice-admiral and lieutenant-general, the service dress features a wide strip of gold braid around the cuff and, since June 2010, above it a narrower strip of gold braid embellished with the executive curl. On the visor of the cap are two rows of gold oak leaves. Konteradmiral is an OF-7 two-star rank equivalent to the Generalmajor in the German Army, see The Guyana Defence Force Coast Guard is the naval component of the Military of Guyana. As such, the ranks of the Coast Guard are naval ranks similar to the practice in the respective Coast Guards of Jamaica and Trinidad, the rank of rear admiral was first awarded to chief of staff commodore Gary Best on August 19,2013. The rank insignia consists of two silver pips with green highlights, beneath a crossed sword and baton, all surmounted by the gold-colored Caciques crown with red, the Indian Navy maintains a rear admiral rank senior to commodore and captain ranks and junior to vice admiral ranks. The rank insignia for a rear-admiral is two stars beneath crossed sword and baton, all surmounted by Emblem of India, worn on shoulder boards, before Islamic Revolution The Iranian Imperial Navy. After Islamic Revolution The Islamic Republic of Iran Navy, known as the Iranian Navy, a rear admiral in the Pakistani Navy is a senior and two-star rank naval officer, appointed in higher naval commands. This article is about the OF-5 rank Polkovnik in mostly Slavophone countries. For the equivalent rank in Anglophone armed forces see Colonel, in Austria, Polkovnik is a military rank in Slavic countries mostly which corresponds to a colonel in English-speaking states, and oberst in several German-speaking and Scandinavian countries. The term originates from an ancient Slavic word for a group of soldiers, however, in Cossack Hetmanate and Slobozhanshchyna, polkovnyk was an administrative rank similar to a governor. Usually this word is translated as colonel, however the transliteration is in common usage, Polkovnik began as a commander of a distinct group of troops, arranged for battle. The rank of polkovnik was used in the Estonian army until 1924, the rank was legalized by Table of Ranks that placed it in the 6th grade as the second-top field officer, right under the brigadier. A promotion to the rank of polkovnik gave a privilege of hereditary nobility, the Red Army reintroduced the polkovnik rank in 1935, together with a number of other former Russian ranks, and it has been used in many ex-USSR countries, including Russia, to the present day. The Rank insignia to Polkovnik is as follows and rank insignia of the Russian armed forces until 1917 Ranks and rank insignia of the Red Army 1935–1940, 1940–1943 Ranks and rank insignia of the Soviet Army 1943–1955, and. By the end of the 17th century, the title of the assignment became a de facto rank as such and started to denote the commanding officer of the entire regiment. During the rule of Sanacja in the period between World War I and World War II, a number of officers were promoted to the rank. During the Invasion of Poland in 1939, the Polish divisions were commanded by officers of many grades, in fact 22 divisions out of 42 were commanded by colonels in 1939. The pułkownicy commanded units of all sizes, from divisions down to mere battalions, in the 18th century, a polkovnyk was a leader of a palanka, a territorial unit of the Zaporozhian Host. The military council elected a palanka polkovnyk to serve for a term of one year and he represented the Kosh Otaman in the palanka and had significant powers, including the right to condemn Cossacks to the death penalty. Leading Seaman is a junior non-commissioned rank or rate in navies, particularly those of the Commonwealth. When it is used by NATO nations, Leading Seaman has the code of OR-4. It is often equivalent to the army and air force rank of corporal and some navies use Corporal rather than Leading Seaman. The rank is used in the navies of Australia, Canada, Ghana, Ireland, New Zealand, Pakistan, South Africa, Sri Lanka and it is senior to able seaman but junior to petty officer. Leading seaman or leading hand, which it is known as, is the equivalent of corporal in the Royal Australian Air Force. Leading seamen are addressed as leader, and informally known as killicks from the anchor which is the symbol of their rank. In the Royal Canadian Navy, leading seaman is senior to the rank of able seaman and its Army and Air Force equivalent is corporal and it is part of the cadre of junior non-commissioned officers. 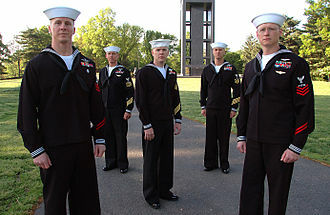 Leading seamen are generally addressed as Leading Seaman Smith. The same rank title is used for female members, the slang term for the rank is killick, as in the Royal Navy. The term is used even though the old-style insignia of a fouled anchor is no longer used for this rank in the RCN. 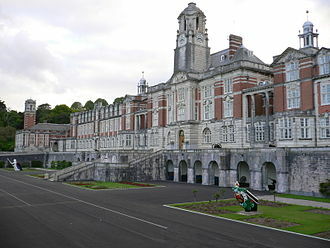 Leading seamen generally mess and billet with other seamen and their army and air force equivalents, privates and their mess on naval bases or installations is generally named the junior ranks mess. Leading seaman is an enlisted rank of the Navy of the Russian Federation. It is senior to the lowest rank of seaman, the rank was introduced to the Soviet Navy in 1946 and inherited by the Russian state in 1991. The former Soviet republics of Belarus and Ukraine maintain similar ranks with the same pronunciation but slightly different orthography - старшы матрос, the rate of leading seaman, leading hand or leading rating in the Royal Navy is senior to able seaman and junior to petty officer. It is equivalent, but junior, to corporal in the other services, the badge is the fouled anchor, worn on the upper arm in formal uniform and on the shoulder slides in working dress. Specialists use the word leading before their speciality, a leading rating is often called a killick, referring to the rank insignia of a fouled anchor. Bombardier is a military rank that has existed since the 16th century in artillery regiments of various armies, such as in the British Army and the Royal Prussian Army. It is today equivalent to the rank of corporal in other branches, the rank of lance-bombardier is the artillery counterpart of lance-corporal. Bombardier and lance-bombardier are used by the British Army in the Royal Artillery, the same applies to the Royal Australian Artillery, the Royal New Zealand Artillery, the South African Army Artillery and the Armed Forces of Malta. The Royal Canadian Artillery uses the ranks of master bombardier and bombardier, the Royal Artillery had corporals, but not lance-corporals. Unlike a lance-corporal, a bombardier held full non-commissioned rank and not an acting appointment, the rank was equivalent to second corporal in the Royal Engineers and Army Ordnance Corps. In 1920 corporals were abolished in the Royal Artillery, bombardiers became the equivalent, the rank of lance bombardier originated as acting bombardier, an appointment similar to lance-corporal and was indicated by a single chevron. For more information on commandant when used as a position, see Commandant. Commandant is a military or police rank, in the French, Spanish and Monegasque armed forces it is a rank equivalent to major. In South Africa for most of the half of the 20th century. In the Canadian Forces, “commandant” is the French-language title for a major of any unit, however, in English, “commandant” is used exclusively to identify those commanding officers responsible for units that provide a service or oversight to some lodger population. Prior to its amendment in 2014, the National Defence Act identified “Commandant daviation” as the French translation for the rank of squadron leader, Commandant is a military rank in both the Irish Army and Irish Air Corps. It is equivalent to major or squadron leader in armed forces. In the Irish Naval Service, the equivalent rank is lieutenant commander, Commandant, is an officer-grade rank of the Military of France, specifically the French Army and the French Air Force, which is equivalent to major. The commandant is styled chef de bataillon in the infantry, chef descadrons in the cavalry and chef descadron in the artillery. 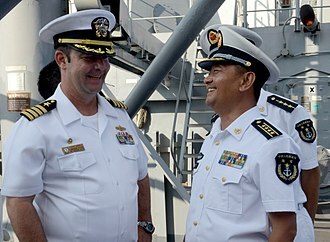 Commandant is the style, but not the rank, of the officers of the French Navy. Prior to the French Revolution, the major was the appointed by the King to keep track of the expenditures. He could have a deputy and could be either a commoner or a nobleman, a major was graded as a commissar, not an officer. The officer at commandant rank level was the chef de bataillon or chef descadron, major is now, the most senior warrant officer rank, above adjudant-chef. Comandante is an officer rank used in some Latin American countries. The Chilean Air Force uses the rank of comandante de escuadrilla as an equivalent to the British rank of squadron leader. The Peruvian Air Force uses the rank of comandante as an equivalent to lieutenant-colonel or wing commander, comandante can be translated into English either as commandant or as commander. The rank may be found in numerous organizations, such as the Sandinistas. It is sometimes used as the English translation of an equivalent rank in countries which have a non-English air force-specific rank structure. It ranks immediately above squadron leader and immediately below group captain. It has a NATO ranking code of OF-4, and is equivalent to Commander in the Royal Navy and to Lieutenant Colonel in the British Army, the Royal Marines, and the US Army, Air Force, and Marine Corps. The equivalent rank in the Womens Auxiliary Air Force, Womens Royal Air Force, the equivalent rank in the Royal Observer Corps was observer commander which had a similar rank insignia. In response to the proposal that the RAF should use its own titles, it was suggested that the RAF might use the Royal Navys officer ranks. For example, the rank that became wing commander would have been air commander and it was suggested that RAF lieutenant colonels might be entitled reeves or wing-leaders. However, the rank wing commander was chosen as wings were typically commanded by RAF lieutenant colonels. The rank of wing commander has been used continuously since 1 August 1919, in the early years of the RAF, a wing commander commanded a flying wing, typically a group of three or four aircraft squadrons. In current usage a wing commander is more likely to command a wing which is an administrative sub-division of an RAF station, a flying squadron is normally commanded by a wing commander but is occasionally commanded by a squadron leader for small units. In the Air Training Corps, a commander is usually the officer commanding of a wing. The rank insignia is based on the three bands of commanders in the Royal Navy and consists of three narrow light blue bands over slightly wider black bands. This is worn on both the sleeves of the tunic or on the shoulder of the flying suit or the casual uniform. The command pennant is two triangular command pennants used in the RAF, two thin red lines differentiate this one from the other. It is used in the Egyptian Air Force, Hellenic Air Force, Royal Air Force of Oman, the Royal Canadian Air Force used the rank until the unification of the Canadian Forces in 1968, when army-type rank titles were adopted.